When I first received Vassa in the Night in my mailbox, I was intrigued. The cover of the book is absolutely stunning, and the story interesting as well.I had the book on my TBR, but didn't start it right away. But, the more I thought about the book, the more curious I became, and I finally just HAD to read the it. I'm glad I finally did! Can I first say that this is one of the weirdest books I think I've ever read? It's inspired by a Russian folktale Vassilissa the Beautiful, a tale that I had not heard of before, but found to be quite interesting nonetheless. I seem to be reading a lot of retellings lately that come from tales I've not heard of before, and I like that! It makes me curious to get to know the originals. I really liked the main character in the story, Vassa. She definitely not had an easy life, especially considering who her parents were, and what she had to grow up with. I like that she always thought of more than just herself, especially when she's thrown into the weirdest situation ever. Also, she has a magical talking wooden doll named Erg, who is a bit of a kleptomaniac and has a bottomless pit for a stomach, whom I absolutely adored! These are just two of the interesting characters in the story. There are SO many more as well! The storyline for the book was fantastically magical. Seriously, you won't believe some of the stuff you read as you turn the pages, this is so serious fantasy and magic we're talking about. And while I thought it was weird at times, I still couldn't get enough of it. (A store with chicken legs, for instance.) The book took a little longer to read than I expected, because I had to go back at times to reread what I had just read, to make sure that I had read it right! 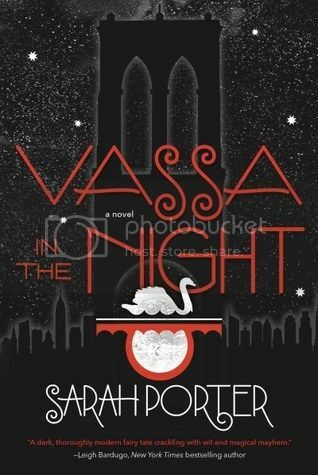 Overall; Vassa in the Night was definitely an interesting read! I can see why it has gotten such good reviews. It's the first book I've read by Sarah Porter, but it definitely won't be the last. I've heard conflicting things about this one, but I'm all about the weird little books. I'm glad this one worked for you - I'm looking forward to checking it out! Ooh nice! Seeing this one around a bit and hearing interesting things! It definitely sounds like an intriguing read! Glad you liked it! Very nice review!